Innovation is the process of brining the new into the world. And the new cannot come from the mind, i.e through thinking. If you carefully understand the mind, it consists of only knowledge. The mind is composed of all the information that we have accumulated till date. It consists of all the knowledge that we have gained from people, places, books, magazines, articles, research, things and objects etc etc. All these information that has been stored in our memory constitues our data base. And this data base is old. Old because this knowledge consists of things that are already there, things that are already existing, otherwise how would it be available in books, magazines, articles and other sources of knowledge. Then it would not be in our memory. We must have had this information collected somewhere, sometime in the past. When we "think", we only search through our data base of old files and perform permutations and combinations with the available data. Therefore thinking cannot lead to creation of something new. Thinking cannot be used to Innovate, because whatever we think is all old. Even our goals are a part of this knowledge. All goals are from the memory; whatever we decide to create in the future, has already been in the past, otherwise we would not be able to make it into a goal. So making a goal to innovate somthing is also futile; we are bound to reinvent the wheel in a different way. Real innovation happens when we force ourselves to go beyond the mind. Companies Fail to Understand Innovtion and Companies Fail to Act. The mind is nothing but a collection of “Objects” and "Language". Objects include everything that make up this world, including humans. Language is used to label or define the objects. Objects and their labels and their relation with each other forms “Knowledge”. My friend is also an object and I have labelled him with his name and related him to me with some language. Unfortunately and unknowingly “I” (Myself) am also a part of my mind, and I have been labelled with a name and related to other objects (including other humans) using language. This relation is a part of my knowledge. So, we come to this conclusion that, objects are real and present in the world outside but the relations are nothing more than fiction which we take is as the truth and these fictional relationships are a cause of ultimate misery of human beings. We take these fictional, language based relationships to be the truth. This is a different topic but it was required in order to explain the mind. Since the objects all over the world are same, the relationships are same, no matter what the language is used, the mind of all the people across the world is the same. It is a collective mind. If I say the word “Television”, the language being a part of my mind, immediately brings the picture of television in front of me. If I am shown the picture of a television without using any label or language, the world “television” come to my mind. Here both the object and the label are in my mind. The moment I pay and buy a television set, I put the word "My" and relate this particular television to the "I" in my mind. This is how it happens. Now if I say the word “ksjuojanoihfdaoidh” (something highly absurd), since this is a "label" you have not known, the mind is not able to come up with a picture associated with the said word. Since this is not a code or any kind of encryption that can be decoded but something that is very very absurd, even if you browse through the dictionaries of all the languages of this world, you will not be able to come up with the “object” that is related to the said word. Had you been using a computer for searching, it would have returned “Not found”, it means that it is not a part of its database. If you are searching using Google, it would suggest the nearest known “label” after searching the whole WWW, but will not be able to search the picture related to the said word, because it does not exist. Your mind will not be able to come up with something related to the given word. The mind will come to a "stand-still". But at the same time, since the given word means absolutely nothing - or the given world cannot be used to label any available object, it gives you utter freedom to CREATE ABSOLUTELY ANYTHING ABSTRACT WITH THIS GIVEN WORD or LABEL. This is innovation. This is a process of going beyond the mind. This also proves that there is a space that is beyond the human mind, and this is the space of creativity. This is the space we we need to be in order to continuously innovate. What I did here is - I created an abstract goal - a goal that cannot be understood by or solved by the human mind. In the process, innovation happened. We will see how an abstract goal can be used to innovate in companies in sections to come in this article. This capacity of coming up with absolutely anything abstract is a UNIQUE ABILITY OF HUMAN BEINGS. Innovation is a capability of humans beings and not of computers, no matter how powerful or artificially intelligent the machine is. Companies fail to understand that innovation is "going beyond the Mind". Companies try to think and innovate and in the process keep coming back to the mind, where we are not supposed to be. We have to understand that innovation means bringing the new to this world. New means something that has not been in this world before. An innovative product or service is something out of the world, otherwise how would it be innovation or Creation. Innovation means going beyond the mind, which is going beyond all knowledge of this world, because our memory, which is our mind, consists of all the knowledge that we have gained till date and everything of that knowledge is old stuff. Innovation is going beyond the old, that is beyond the mind, to bring the new and the new automatically come when we go beyond the mind. The process of innovation is automatic, our only job is to push ourselves out of the mind. All our knowledge is old, because it consists of knowledge of things that has already been existing. It means that innovation cannot be learnt by reading about it or gaining more knowledge about it or thinking about it. If you are reading about it, it means that it already exists. You cannot try to know about it. You are trying to know implies that you know that it exists and you want to acquire knowledge about something that exists. Once we know that it exists, it is already there, so what is there to innovate? It would mean reinventing the wheel. We have created terms like “Creative Thinking” for me it is utterly wrong because if you are thinking, you cannot be creative and if you are creating the new, you are not thinking. Companies Fail to Understand that Innovation is not restricted to only one particular job: Whatever job a person is doing, whether it is a process, a repetative job or new product development - he or she can be utterly innovative. He or she can be innovative only when that person is pushed beyond the mind. The effort of the companies is to device ways, whatever the job function may be, to push the people beyond the mind. The rest happens on its own. Companies fail to understand that innovation is a “process”, with which the new is brought into this world. It just happens! "Happens" is the Key word here. And the point that has to be understood that it "happens on the way" and it "happens unknowingly". Whenever innovation happens, the person involved in the process will never know that it has happened. He or she cannot know it, because to recognize, it has to ke known to him in advance. If it is known, then it cannot be innovation. How can you know about something that is neither in your mind nor in the world outside. And once it has happened, it becomes a part of the mind. It becomes old. It adds to your knowledge. People start reading about it and the product of the process called “innovation” becomes an innovative product or an innovative service. But once it has happened Innovation is over. From that time onwards, whatever is being done on that particular product or service is not innovation. Because then it has become a part of your mind, it has become a part of your knowledge. We should look at nature and learn. We all have seen that in Nature, everytihng is happening. Everything is a "Verb". The way I look has changed drastically from the time I was born and today and I am continuously changing. It looks constant because the process is very slow. While it changes, nature has been Innovating. The best part, Nature never repeats. Every "happening" in nature is utterly new. Companies make innovation into a goal. They develop teams to innovate by hiring the best talent from the best colleges and universities. They invest a lot of money. These people who are hired for innovation are given KRAs (Key Result Areas) which points to coming up with something new. What happens is that, the people who are hired for innovation, they keep thinking about what to innovate and how to innovate. In the process of thinking they keep going back to their minds because there is no where else to go. When they keep thinking, they constantly keep playing with what knowledge they have acquired till date and in the process keep playing with the old. But the mind cannot bring about anything new. They most of the times come up with something that is already there. When a goal is set, the goal has to be something of the mind; it has to be something that is a part of the knowledge. People who has been hired to innovate, takes that which is already there in the mind, something knowledge bases, something old, something existing as a goal and start chasing something, which cannot never be an innovative product or service. And this way they fail. We fail to understand that during the process, innovation being a process of creation, we may be creating, we may be innovating, but we miss those precious moments of innovation, because our eyes see only the goal. The moment a goal is set, the result is either a success or failure. It becomes "digital" consisting of “1” and “0” and nothing in between. But one has to understand that innovation, being a process is never “digital” but “Analogue”. Wherever there is a question of failure and success, there comes a fear - Fear of failure. The people who are into this job of “innovation” with a goal suffer from fear of failure and in order to do away with this fear, they keep going back to their own minds to search for something that would not make them a failure. Other than the mind they have nowhere else to go, and more they go back to their minds, the more they move away from where they are supposed to be. All the above steps constantly keep taking away the so called “Innovators” from the place where they are supposed to be i.e. Somewhere Beyond the Mind. The companies have to devise something that is capable to keeping the employees responsible for innovation and creation, in a “place” that Beyond the Mind. Remember: Innovation cannot be taught or learnt. Innovation is neither a problem or a puzzle that can be solved - It is a process, that unknowingly happens when we are pushed beyond the mind. It unknwowingly happens because we do not know what is going to come up. What comes up, the mind will not be able to recognize it because the mind does not know about it, it is not a part of our knowledge. We can device ways that can be used to keep ourselves beyond the mind. The more we are kept beyond the mind, more innovation happens. The whole effort should be to push the innovators beyond the mind and not make them forcibly innovate. When One is just pushed beyond the mind, reason, knowledge and logic, Innovation happens on its own. I have already mentioned that innovation cannot happen by using our minds, by thinking, because whatever the mind contains is all old, it is knowledge that has been gained till date. Being in our minds we cannot create or innovate. The employees should be pushed beyond the mind in order to come up with something new. We all, in this contest, are old enough to understand that all our problems in our daily lives cannot be solved by thinking. We think and think and when we are tired and give up thinking, suddenly something happens. It happens in a very different way. It happens in a way that we could never imagine that this way it would happen. Whatever unimaginable happens, it was not in our minds, otherwise we would have done it or at least thought about it. The same principle should be applied in companies. One way of going beyond the mind is to be aware of its contents. The moment you are aware of the knowledge or logic that is there in our minds, you go beyond the mind, otherwise how will you know it. To know it you have to see you mind from the hilltop where your mind is the valley. But it is not so easy. One has to be self-aware for this. This is the age of the internet, of satellite television and that of jet travel. This makes the world one society. People living in one society have similar minds because the source of knowledge is same for all. The kind of thoughts, problems, desires and dreams that I have, others also have. So, to know my own desire is to know the desire of millions of people. For Eg; If I am finding it difficult to find a good job for myself, there are thousands of people who are also finding job search difficult. Some guy understood it and started job portals on the internet and I am sure in every job portal there are millions of subscribers. This guy looked within himself and did what he wanted for others as well and got paid for it. Someone who understood humans better started social media web sites. The person who started a social media website, understood that humans have forgot to love and approve themselves and they always seek approval from others. He understood that since we have forgotten to approve ourselves, we seek attention, we want to become famous. He came up with a website where we post whatever is there in our minds and wait all day for “likes” and “comments”. He understood that we want to speak out, he understood that we want others to listen to us and he, in the website he created space of speaking our minds. I have seen, some people post in such sites even when they go to the bathroom and receive “likes” and comments. He made us all famous and this is what we wanted. He went deep inside himself, he found what he exactly wanted, he searched within himself what he craves for and provided a platform for the world to do the same. The situation is such today that, even my 12 year old niece also has an account in one of these sites. This has to be understood that humans are full of desires, dreams and these lead to problems and craving. Humans like to crave, cry and talk about their problems, think about their problems more and more, but they cannot solve them. Because the basic fact is that not all problems can be solved by thinking. The solution is most of the time available beyond the mind, we have to "innovate a solution". The real innovator goes beyond the mind and the solution comes on its own. He or she need for find a solution, but solution comes automatically, innovation happens on its onw. The only effort required is to go beyond the mind. Knowing ones own dreams, desires and problems lead to knowing of the desires and problems of millions of people and finding a solution for youself leads to finding a solution for the problems of millions of people, because we live in the same society. One who can go deep inside oneself and understand them, can be a very good innovator. Remember: Knowing the contents of the mind, takes you beyond the mind. Another process of going beyond the mind is being present in this moment - being present here and now. We all know that we are constantly in thinking mode. We are never here and now. We are either in the past or in the future. We are in ours minds. One great way to be here and now is through action. To act, one has to be here and now, otherwise how will you act. The moment you start acting, when you start concentrating on the work that lies ahead, you leave our past and future and land in this moment. Your mind is your past and future. Your future is also a reflection of the past. You think about the future, with the knowledge that you have gathered in the past. And innovation cannot happen being in the past. The moment you get engrossed in the work that you are doing, you have gone beyond the mind and innovation happens. In that engrossed state, whatever you do is an innovation. We constantly miss it. Because we are goal oriented. We miss the steps that we have been taking all along the way to our goal, and keep our eyes on the goal and keep waiting for its arrival. As a result we miss a great deal of creativity and innovation. The Goal is mind based, the goal cannot be an innovation, and in the process we miss all the steps where we have innovated, because we have been constantly concentrating on the goal. This is my own experiment - I was sending around 20 emails in a day. Just for the sake of an experiment, one day I took prints of all the email that I sent in a month. When I compared, I saw enormous variations in the quality of the emails. Some mails were just fabulous! The language was most appropriate. In some of the mails the words that I used were most appropriate and those words I never use but I knew them. But in those emails I used some extraordinary and most appropriate words. These beautiful mails have have “happened” when I was completely engrossed in my work. They happened when I was no longer my mind. They happened when I was no longer my past or future. They beautiful emails happened when I was completely present in this moment, here and now. They happened without any effort. And I did not know about it. It was only when started comparing the emails, I detected, otherwise never in my life I would have looked at them. This is what real innovation is. It happens without any effort, when you are not your mind. It happens when you go beyond knowledge and logic. This happens when you completely lose yourself in the work that you are doing. It happens when “you become your work” and you are no longer “you”. Understanding that Innovation is a process: It has to go deep inside innovation managers that Innovation is the process. It is not the end, but it is the “happening”. One has to understand that innovation happens. It happens when one is able to leave the mind, which is old and not capable of innovation, behind. The moment we try to make innovation an “end” it no longer remains innovation, because, I repeat, It is the process of creation. One has to understand that many times in a day while working, we go deep into our work leaving our minds behind, but we are not aware of it. In these times, innovation happens. Many times we unknowingly create beautiful things, our work, whatever we are doing in those short periods are extremely meaningful and beautiful, but we are so goal oriented, that we completely miss that. If anyone is able to capture these moments, one will be surprised to see that he or she has created. The job of managers is to see that these moments are not forgotten or left behind, but captured. Not setting a goal - We are so goal oriented. None of us would move a single step without a goal. Having a goal is life or at the workplace is good, but not at all good for innovation. The moment you set a goal you put the “so call innovators” in reverse mode. With a goal for innovation, comes fear of failure, because by asking them to innovate, you are pushing them hard. We are all humans and we all fear failure. To protect us from failure, we search our minds to find rationalization or logic or protect ourselves from failure. This takes us back to our mind and we do not innovate. If we set a goal, a failure is inevitable - If we reach the goal, which is a mind thing, is not innovation and if out of fear of failure, we go back to our minds to protect us from failure, we no not innovate. No one wants to fail and everyone has a fear, that if he or she is not able to innovate, he may be thrown out. The manager, who manages innovation, has to make sure that he understand that innovation is a process and it is an “endless” process.and he also has to make sure that there is cannot be a goal. He has to make sure that the people are out of fear of failure and also, the so called “innovators” has to be told that even if they are not able to achieve whatever has been given to them, they are out of risk. This will make them free of the fear of failure. Whenever we are not free, whenever there is a doubt or fear, we turn to our minds for a solution. Turning to our minds kills creativity and innovation because we refer to the old, and miss the new. What Kind of Goal Should be set that would make innovation happen? The Goal that should be given to the “innovators” should be an ABSURD one. Something very very out of the world, something very weird. The employees or innovators should now be pushed towards this absurd goal. The Idea is to make them go beyond logic, to push them beyond the mind. What happens when you find something really absurd? When you find something absurd, the mind is not able to understand it and solve it. Because it goes beyond reason and the puzzle cannot be solved with the knowledge that has been gained till date, the whole effort that will be put by the employee will be not from the mind, but FROM BEYOND THE MIND. When the employees are now pushed towards the goal hard, whatever they do, will be beyond the mind. May be they will come up with something very different. It will surely be an innovation because it has come from a “place” which is beyond the mind, knowledge, logic and reason. This is what our objective is - TO GO BEYOND OUR MINDS. The rest happens on its own. The whole organization becomes creative. The Innovation will not be restricted to people who are only hired to innovation. Starting from the people managing the front office to the CEO will work in a fashion that will be new. Every action of every employee will be fresh. People in the organization will no longer be mentally or physically strained. People will no longer be hired for Innovation in particular. People will be just hired! And these people will start innovating automatically, in whatever they do. Whether they are in marketing or research, they will be doing things differently. Without a goal or when there will no longer be guidelines, everything that will be done, things as simple as making a powerpoint presentation will be different and may be very new. If these “different things” that have happened on the way while working without a goal are noted by their managers, one will see that there has been a lot of new things that has happened while they work. When these things are given attention, may be a huge amount of innovations will be found. This will happen because there is no goal, or an absurd goal, which can never be reached. Therefore, whatever has happened in the attempt to reach the absurd goal will be all new and beyond the mind. There will be no fear of failure, so the employees will be pushed away from their minds at all time, which is our requirement. Fear of failure pulls one back into the minds in search of logical reasons to find defence against failure. This hampers creativity. Since the goals will be not reachable, but the results will be on the path, there will be no fear of failure. This will lead to the making of what I would call a “Rebel Organization”. It will be an organization where everyone will be a rebel. By rebel I do not mean that the employees will defy their bosses or something external. A rebellion, according to me is always internal. It is going beyond the rules and guidelines and beliefs. Rules and Guidelines keep us within our boxes, but the moment we defy these rules INTERNALLY, we automatically become creative. This is because all rules and guidelines are of the mind. Staying within them will take us nowhere. In such an organization, since they will be free and will be pushed towards an absurd goal, every action will be beyond the mind, and each one will be a rebel. Since “Innovation” will run in the blood of the organization, companies will eventually do away with the word “Innovation”. The day this happened, it would mean that the whole organization has become innovative. Whenever a company makes plans for innovation, it means that the company and innovation are separate. And it is correct, because the company is not innovation, it is just a department in the company. But the day both merge the word "Innovation" will also no longer exist and may be these super innovative companies will ke known by some other name. One can imagine this one department which is known as innovation department, will proliferate and cover all the departments making the whole company innovative. The company itself would become an Innovation. It will be a rebirth. Start with the objective in mind to one day do away with the word Innovation :Start with the objective in mind that one day, which is not very far, we have to do away with the word “innovation”. For this, innovation should not be restricted to one department, but the whole company should become innovative. Not to hire only for innovation:What I suggest is that, instead of hiring employees to make your new innovation department, we bring one person each from each department in the organization and train them in the above lines. Later on they go back to their respective departments and implement what they have learnt in their own departments. They will be the innovation leaders of each department. They will perform their assigned jobs and at the same time, they will inculcate this spirit among others in the department, including the department head. This is what I mean by proliferation of the “innovation department” to cover the whole company. When these people are ready, they go back to their own departments and thus this department called the innovation department will no longer exist. Initially for some more time it may exist, they may together have meetings and discussions, but with time, this department will no longer exist. This is done to make the whole company or organization innovative and to make sure that innovation is not restricted to only one department. Decrease the probability of failure - Developing New jargons: Jargon plays a very important role in our lives. Good, Bad, failure, success, right and wrong are mere words used in our daily language, but they play a very important role in our lives. Use the word “good” and see the person’s face, who is being referred to, use the word “worse” and see the same persons face. You will find a very drastic change in the vibration of the person. I always say “to fail you need the society, to succeed you need the society”. In order to escape failure, the person with whose reference the word “failure” has been used, will recoil from society. He will then be termed as an escapist, another powerful jargon. This will completely kill innovation, because innovation happens when you open yourself and not close yourself. The person will be lost. Failure is bound to happen, if we are on an endeavor to innovate. There will be various trial and error. When one jumps into the unknown, it is possible that many times you will happen to place your foot on the wrong place, before one arrives. This is a part of the process. But you will place your foot on the wrong place only when you take the jump. But we, our society, has created jargons, or language, that drastically deter the chances of jumping into the unknown. So I suggest, as the first step, we make a change in the jargon. Now there is a 50-50 chance. Either it is a success or failure. There is always a 50% chance of failing, which I feel is quite high. It is always either this or that. There is nothing in between. What we need to do is - incorporate another, at least, 8 more terms in between success and failure, so as to reduce the chances of failure to 10% or less. We need someone to watch: We need a "witness" or we need a silent spectator who will keep watchin the process while the work in on. His or her job is to recognze innovation. This is because it is impossible for the person involved in the job to recognize innovation. As I have said before, innovaton happens unknowingly, it happens only when the person involved is pushed beyond the mind, or the person gets so involved in the process that he forgets about the goal. So it will be impossible for the person to recognize Innovation. I shall divide the organization into people who are into a process i.e. a routine or a repetitive job, people who are into new product development and People who are responsible to start a new business in a company or are an entrepreneur. The material should be flexible. It should be deformable and should have “shape memory”. When I keep it in my trouser pocket and drive, while I sit, it should take the required shape i.e. it changes shape, whenever it is stressed, to reduce the stress induced to a null, it changes shape and whenever the stress is withdrawn, it comes back to its original shape. The Goal that I have set is very absurd. No solution is available. The knowledge required to develop is not there as yet. Being the manager, I know that this goal may not be achieved in another 10 years time, but I don’t care about the goal. I care about what happens on the way, everyday and every hour when I proceed towards this absurd goal. The engineers will initially be puzzled. They might also call the manager and mad to have set such a weird goal. Some of them might also think about quitting the job. This is natural. But I am sure, some will stay and would be interested. In the process of reaching this absurd goal what may happen? The material developed for the body of the cell phone, may be in future, used in the F1 cars. Who knows? The company may come up with a completely new television technology, a wireless technology, New kind of electronic materials to be used in supercomputers, laptops, PCs etc. The company in the process may come up with new electronic circuit technology with new materials. This may force engineers and scientists to go to nano or further down and come up with new microscopes for studying materials at these scales. The company may come up with new alloys and composites, which may be used in many other applications. What I mean is that, when you move towards an absurd goal, possibilities are open. The company may choose what to do and what not to do. What will come up is unknown. This is what I call - experiencing “GOAL-LESS-NESS”. This is when you have a goal and yet it is not a goal. When we experience goal-less-ness, every step in this state will be an innovation. This way you totally rule out the word failure. Because, every step towards the direction of this absurd goal will be an innovation and there will be no scope for failure. It will not depend on the abilities of the guy working, it depends on whether we are able to push him beyond his minds. In pushing a guy beyond the mind, a absurd goal is the best solution. We do not need a genius to do it. Let us try to understand it with a simple example: I am writing a novel. When I have done, lets say, 20% of the work, the work gets picked up by my fiance Shilpi and she starts from that point in a different direction, while I continue to write as per my idea. Then while Shilpi has finished another 20% using her imagination, my brother Bikram Picks up from that point in another direction, while Shilpi continues to write in the direction in which she was writing. And this goes on. Initially I was moving in the direction of one absurd goal, now there is movement towards 3 absurd goals and innovations keep happening on the way. If I call more people to take part, then more innovaiton will happen. 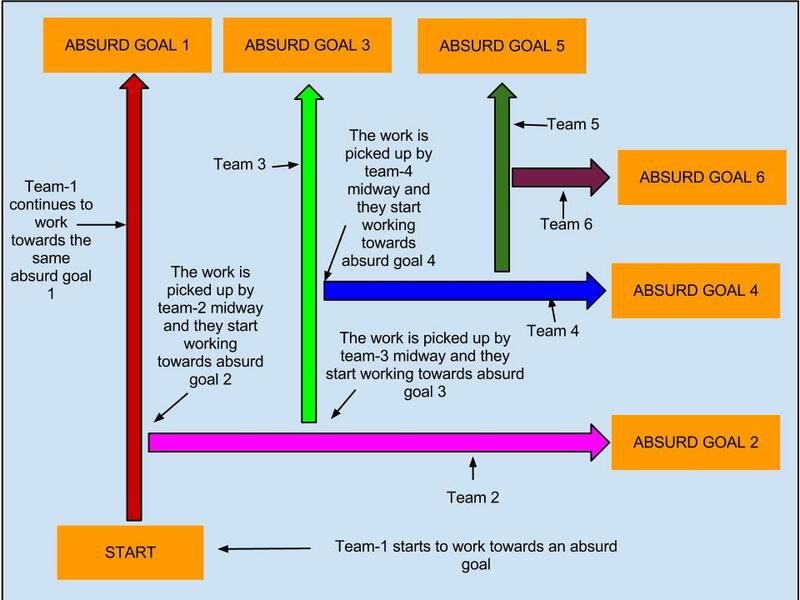 Team -1 starts working towards an absurd goal, like the one which I have mentioned above. While team -1 has moved a little, team-2 picks up from that point and starts moving towards absurd goal 2, while team 1 continues to move in the direction in which it was moving. Them while team-2 has done little work in the direction of absurd goal 2, team -3 picks up from that point towards absurd goal 3, while team-2 continues to move in the direction of absurd goal 2. And this continues. Every new development in the direction of the absurd goal should be noted. New people may be recruited to detect innovation. Here I take advantage of the fact that, whatever is the goal, it is absurd. It does not make a difference what it is. Also since the goal is absurd, it does not matter whether I have one such goal or 10 such goals or 100, it is as good as one goal, the process of reaching the goal is important, the path is important, the witnessing is important, but I involve more teams. This allows me to move simultaneously in different directions and get more and more innovative products or services. Here Innovaton needs two steps: (1)Watching or Detecting Innovation and (2) Applying what has been watched. These employees can also be very innovative. For them, innovation happens from time to time while they work. You can refer to my email experiment above. Innovation was happening but I did not notice while it was happening. Only when I looked at it under a magnifying glass, I detected innovation. When it happened I was not aware of it. It means that - I again, did not have a goal to innovate, I did not bother about innovation. When it happened, probably I was experiencing "goal-less-ness". People who are working in a process, and they repeat their job everyday, even in that repetitive job, they are innovating. One should understand that they are innovation in the quality of the work. But it goes undetected because, with the kind of job they have, they are only bothered about the deadline. The deadline is the goal, but on the way to the deadline, innovation happens. It happens when during moments, they forget about the goal and may be experiencing goal-ness-ness, and during that time, whatever happens, will have a different quality to it. May be while working in their repetitive jobs, they are, in short times, working in a totally different manner. But it goes undetected. Maybe they have completely changed the way they are working. Since there is no product development, the innovation will be very Subtle. It will many times go undetected. Here innovation will happen, when while working, the team members will happen to go beyond the mind, and experience goal-less-ness. So in this case the WITNESSES are very important. Witnesses are people, who will watch carefully, without judgement or analysis to detect any innovation, because the moment the Witnesses start analysing, they will miss it, because the mind will come into the picture and the whole innovation will go undetected. The abililty of the witnesses to JUST watch is very important, I would like to place maximum emphasis on this process of watching and detecting innovation. Whenever the witnesses detects an innovation in the process, which may be a very new way of working, which seems to be quite good, after discussing with other seniors, the same process may be implemented in other teams in the same line or in the other lines. The best way to detect this innovation is to examine this work separately for each employee. When you examine the weekly work of a single employee, by dividing his or her work into small parts (all the parts will be the same work, making it easier to detect a variation), you will detect variations in the same work. Some parts will be brilliant and some parts will be just satisfactory. If one keeps examining the work of every employee, then maybe, some day a drastic variation may be detected. This variation if studied and implemented, may change many things in the process. It cannot be said what will change, because we do not what will come up. The best way to come up with an innovative idea is to go deep inside oneself. They should remember that this world is one society and the problems they have are the same problems millions of people around the world have. They should remember that there is no end to human desire and dreams and almost all the dreams and desires are not fulfilled. Even if they are fulfilled, there are new dreams and desires coming up everyday. If you know yourself well, you will be sure about what I am saying. If an entrepreneur knows the dreams and desires of his own, they will know the dreams and desires of millions of people around the world. The best place to search is their own minds, by stepping out of the mind. They should not find rationalizations for each problem, rather see the problem as an opportunity. Whenever we have problem, we are trying to reach somewhere but we are not able to, due to human limitations. This human limitation is the scope for an entrepreneur. There is always a huge gap between the problems, dreams and desires of humans and their solution. Humans generally give up and satisfy oneself with the existing available solutions or rationalize but they do not try to solve them. They are not solved because they do not go beyond the mind. The job of the entrepreneur is to push himself beyond his mind, find a solution to his problem and then apply the same solution to the problems of others and in return - get paid. There is a gap between what we want to have or where we would want to reach and where we are not able to. The gap, may be filled up with technology or whatever innovative idea the entrepreneur may be able to device. Every problem the entrepreneur comes across should give rise to a possibility of doing a startup. That is why it is very important for an entrepreneur to know his own problems. To know the problem that is there in the mind, cannot be found by staying within the mind, it can only be detected and solved, by going beyond the mind. So an entrepreneur need not search anywhere else for an idea, but only within it mind, from a “place” which is beyond the mind. If he stays within his mind, he will try to rationalize the problem and never look at the solution. The author really needs to purchase spell-check! I totally agree with your concept of absolute knowledge. For years I have used this argument to 1) demonstrate to scientific types that the knowledge we now have in our possession is only a minute fraction of all of the knowledge we have available and, this being the more difficult notion, 2) we as humans have absolutely no concept of what lies outside of our realm of knowledge. For example, ask a group of people, of all ages, to sketch what an alien would look like. In all cases there would be eyes, arms, legs, etc. That is a product of our knowledge only and, in all probability not anywhere accurate. In fact, the whole human thought process is an enigma outside of our worldly experience.